Peonies on the temple grounds. Protector of one of the directions, maybe south? Not sure. I would not mess with him regardless. The Pagoda Forrest. 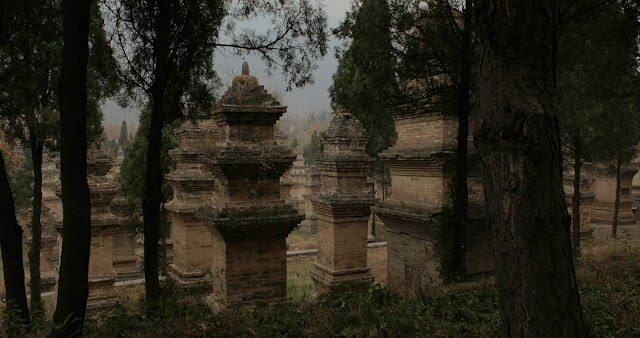 A final resting place for the temple's more revered monks. The guide book describes the Shaolin temple as "a victim of its own success" for two reasons. Firstly, it was frequently attacked, and torched most recently in 1928. Many of the current building were rebuilt in the 80's, and then renovated to original specs as late as 2004. Secondly, it is now the target of marauding groups of tourists (mostly Chinese) and features a 'zen music experience' and cable cars to the top of Song Shan mountain (a fast track to the center of heaven and earth). We trudged past the temple and Kung fu school, up the hill to a small village that exists primarily to feed, host and train both the visiting tour groups, and Kung fu students not enrolled at the main Shaolin school. As it was, our hostel was unexpectedly closed for renovations so we negotiated with one of the restaurants to sleep in their surprisingly clean room upstairs. As much as I may question the veracity of some of the details in the Bodhidharma's story (can anyone really sit staring at a cave wall for 9 years and leave a permanent shadow? 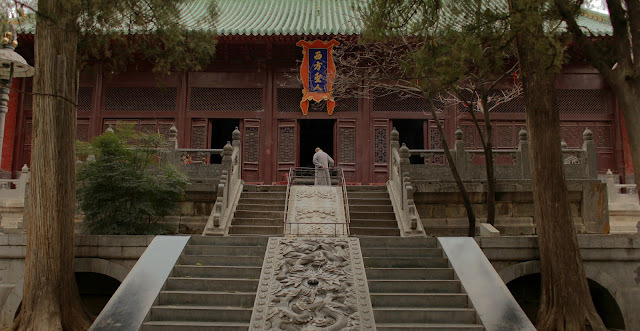 ), it was humbling to walk in the birthplace of Chan/Zen Buddhism and the cradle of Chinese Kung Fu. The Bodhidharma has been depicted in Bhuddist art as "a rather ill-tempered, profusely bearded and wide-eyed barbarian". He is referred as "The Blue-Eyed Barbarian" (碧眼胡) in Chinese Chan texts" hmm, is Joe Gannon the modern day incarnation of the guy who whipped the Shaolin monks into shape? We watched some students in their afternoon workout. The Shaolin school teaches academics as well as a variety of martial arts, and includes elementary through post-high school training. They say they have an 80% employment rate after graduation (professional, not just action movie stars) but it's only for boys. Anyway, could be a viable alternative to sending your kid to military school if he's a trouble maker. It was too late to make the trek up to the aforementioned cave, but we did get to visit the Shaolin pharmacy and stock up on some topical analgesic that a monk recommended.